MOC part III Written secure exam is now offered for the year 6 Maintenance of Certification (MOC) exam. Two – 50 question exam “selectives” are chosen by the Diplomat. The test selectives include two identical lists each consisting of Obstetrics and Gynecology and Office Practice & Women’s Health, Obstetrics only, Gynecology only, or Office Practice and Women’s Health only. Each diplomat must choose one item from each of the (two identical) lists at the time of their application to the Board. The exam is 105 minutes; questions will be multiple-choice, single-best answer type and are based on common clinical problems. OB/Gyn Board Prep courses will prepare you for the year 6 MOC written exam. Maximize your study efficiently with our time saving exam–focused review courses. These OB/Gyn Board Prep programs are the only courses available where diplomats are provided with extensive exam exposure to MOC “test selectives.” You will have the opportunity to recognize your vulnerabilities and knowledge gaps through exam questions which focus on the latest practice guidelines published by ACOG. Our time-saving study aids are guaranteed to contain what you need to pass your exam all in a fraction of the time in comparison with other courses. This is a highly acclaimed and invaluable addition to your study program! 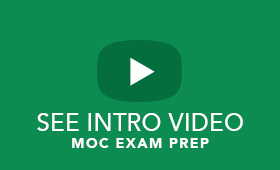 We review the most common questions on the MOC examination and teach written exam techniques. Extensive written exam exposure with discussion on how to tackle difficult questions is provided. High yield lectures are also covered and a study guide and the exams are included. All the exams are based on the test selectives. Breakfast and lunch is provided with your registration fee. Exam questions are reviewed of the right and wrong answers on common exam topics based on latest Practice Bulletins and Committee opinions. This is the only LIVE interactive ONLINE program of its kind! Exams are administered on a weekly basis and include answers and explanations. Prior program participants have stated this was the building block of success on the Written, Re-entry and the Re-certification exams (with a 100% pass rate). Course material is included. Each session is recorded for view at a later date. Manual of 600 test questions with Study Guide. Also includes references plus explanations of answers to all exam questions. Review Packages for the MOC Exam are available. Options are nightly webinars, private tutoring with a board-certified faculty member, live courses, mock exams, and home study guides. Multiple package levels are available. These can be designed specifically for previous exam failures, or written candidates seeking extra assistance.